Join us for BELI's premier event: A Day of Mini Workshops! BELI will bring together some of the best belly dance instructors in the area. Each instructor will teach a mini one hour workshop. Students will be able to participate in one or multiple workshops. The more you take, the more you save! See below for rates and workshop schedule. Purchase 4 workshops and get FREE Lunch! Add Glamour and Grace to your next performance! Let Kelly show you how to utilize Fan Veils to create illusions from ethereal to dramatic. This workshop will cover proper technique, transitions, turns and moves that are visually appealing for small and large venues. *Requires two fan veils. Bring your own, purchase or borrow! Have you always wanted to dance with the sword but have been too intimated? Or do you already dance with he sword but need some new tricks up your sleeve? If you answered yes, then this workshop is for you. Students will learn simple sword movements, proper balancing techniques, sensual floor work and sizzling combinations! *Requires a sword. Bring your own, purchase or borrow! Join Aiza as she teaches you to master the technique of being Powerful yet Flirty during the Saidi "Cane" Dance. During this workshop you will learn the history behind the Saidi dance, proper authentic cane technique, and foot work through cane combinations. *Requires a cane. Bring your own, purchase or borrow! An introduction to double veil techniques and tricks! Delight yourself (and your audience!) with the beauty of double veil. Learn transitions, hand positions, turns & twirls along with the different types of veils that will best showcase your desired effect. 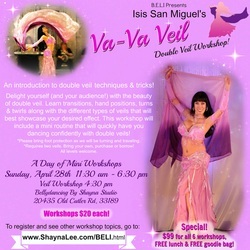 This workshop will include a mini routine that will quickly have you dancing confidently with double veils! *Please bring foot protection as we will be turning and traveling. All levels welcome. *Requires two veils. Bring your own, purchase or borrow! The drum solo is one of the most exciting portions of the belly dance performance and showcases the belly dancer's technique and how creatively she can interpret the music. Monica will teach some combinations used in a drum solo choreography with her signature style. You can even use these combinations in your own drum solo choreographies or improvisations!